P30 « Tech bytes for tea? 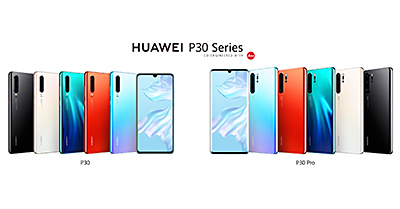 China phone maker Huawei launched the new P30 (128GB/8GB – S$998) and P30 Pro (256GB/8GB – S$1,398) in Paris. The two phones will hit the shelves in Singapore on 6 April, 2019. For Singapore, both the Huawei P30 and P30 Pro (256GB) will come in colours of Breathing Crystal, Aurora and Black while the P30 Pro (512GB) will be available in Aurora. The new phones feature Huawei’s SuperSpectrum Sensor, an optical Huawei SuperZoom lens, a new Time of Flight (TOF) camera, and better OIS and AIS image stabilisation technology. Customers can head down to VivoCity, Central Court Level 1, from 10am to 10pm over the weekend (6 April) and receive a gift set worth up to S$470 with every purchase of the Huawei P30 or P30 Pro, while stocks last. Preorders will be available online to customers from 27 March (Wed), 12am SGT, through local telecommunication operators and at Huawei Official Store with Lazada. The upsized variant of the HUAWEI P30 Pro with 512GB storage (S$1,698) will also be on sale exclusively for shoppers on Lazada, with limited quantities available.